Posted on 16/04/2012 at 12:23 PM. I have put together a range of 20 mixed saltwater flies suitable for #7 weight + outfits and designed for people to use in estuaries to cut their teeth on saltwater fly. The flies are all tied on the highest quality hooks and presented in a quality Scientific Anglers double sided waterproof fly box. 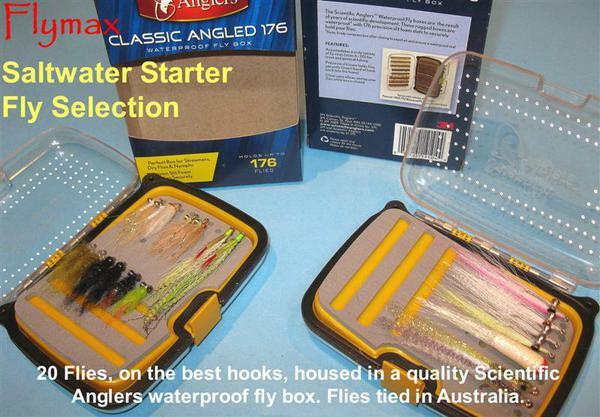 This isn't a token effort price point fly selection - these are great flies in a classy box that won't rust and with foam that won't fall apart. I also have a selection of 15 flies for salmon & tailor including Surf Candies, Eye Candies and Tasman Minnows that is suitable for #5 weight + outfits. Both packs retail for $175.00 + postage.